It’s hard to believe that it’s been 30 years since we said goodbye to the Bradford clan of Eight is Enough. The dramedy ran for five seasons and 112 episodes before ending on May 23, 1981. 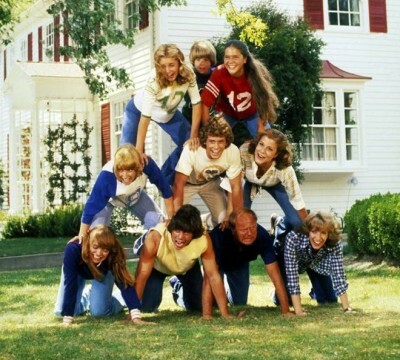 Eight is Enough was initially based on a 1975 book written by newspaper columnist Thomas Braden about his real-life family. The show ended up bearing little resemblance to the book, other than the family names and the father’s profession. Interestingly, prior to becoming a journalist, Braden was a veteran who worked for the CIA and his wife had been a companion to the Kennedy family. When the show starts out, David (Grant Goodeve) is the only child living on his own. Mary (Lani O’Grady) is the second oldest child, studying to be a doctor. Joanie (Laurie Walters), Susan (Susan Richardson), and Nancy (Dianne Kay) are in their late teens/early twenties and studying acting, fashion, and modeling respectively. Elizabeth and Tommy (Connie Needham and Willie Aames) are in high school, and the baby of the family, Nicholas (Adam Rich), is still in grade school. Who's your favorite Bradford kid? As the second season begins, we learn that Joan has died a year earlier. As the show progresses, Tom falls in love and marries Abby (Betty Buckley), a schoolteacher, who had originally met the family when she was tutoring Tommy. Later in the series, Susan gets married to baseball player Merle “The Pearl” Stockwell (Brian Patrick Clarke), and David marries Janet McArthur (Joan Prather), in a special double wedding. Cousin Jeremy (Ralph Macchio) moves into the Bradford family home towards the end of the series (in the spirit of The Brady Bunch’s cousin Oliver) in an effort to bring new life to the series but it was too late. The ratings had declined significantly over the years. It debuted mid-season in 1977 and was the 23rd most watched show with a 21.1 share. For the 1977-78 season, it moved up to number 12 with a 22.2 rating, narrowly beating out The Love Boat and Soap. The audience grew for season three and dropped back down to season two levels for season four. By season five, the audience rapidly lost interest and Eight is Enough didn’t even make it into the top 30. There was no closure in the final episode. However, the Bradford clan was reunited six years later on NBC for a made-for-TV movie called Eight is Enough: A Family Reunion. All of the TV show’s regular cast returned except for Buckley who was filming Frantic with Harrison Ford in Europe. She was replaced by Newhart’s Mary Frann and the movie stayed fairly true to the original series, even giving a small nod to Hyland’s character. Despite airing opposite game two of the World Series, the reunion was the sixth highest-rated TV movie of the season. An Eight is Enough Wedding reunion movie followed in 1989 but wasn’t nearly as successful and that was the end of them. Last year, the Today Show hosted a reunion of the cast. It was the first time that Buckley had been with the rest since the TV show went off the air in 1981. Unfortunately, Rich was not present and O’Grady had died in 2001. Though a lot of time had passed, it was clear that there was still a lot of love and admiration among the former TV family members. What do you think? What are your memories of this TV series? Which theme song version do you prefer? The superior acting, genuine warmth, beauty and overall charisma of the great Betty Buckley is what kept this show going. Would love to own the whole thing on DVD. I love the second theme song, an d it goes very well with the video showing the family in comical scenes. My favorite memory, and that was as a pre-teen was when the kids threw one of their parties, the older kids tried to clean it up and the parents came home early. Why don’t we have shows like this one the air anymore? Thanks. I’m feeling very old right now.